The partial hospitalization program at Sarah A. Reed Children’s Center provides children (ages 3-5) and their families an opportunity to engage in a comprehensive treatment experience designed to treat the “whole” child. The program offers a level of care that enables stabilization of the child’s emotional and behavioral disturbances with a therapeutically supported diversion from inpatient care. 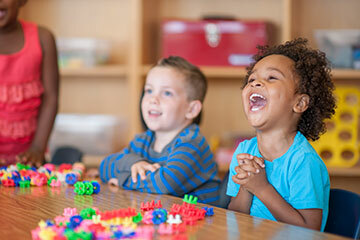 The goal is to restore a level of functioning that enables the child to successfully return to a regular preschool setting, re-enter the community and improve overall family functioning. The program is located at our Hamilton Campus and runs Monday through Friday, 9:30am-3:30pm and operates 12 months a year. The partial hospitalization program at Sarah A. Reed Children’s Center provides children/adolescents (ages 5-18) and their families an opportunity to engage in a comprehensive treatment experience designed to treat the “whole” child. The program offers a level of care that enables stabilization of the child’s emotional and behavioral disturbances with a therapeutically supported diversion from inpatient care. The goal of the program is to restore a level of functioning that enables the child to successfully return to a regular school setting, re-enter the community and improve overall family functioning. Utilizing the Sanctuary Model® , the program embraces the 7 Commitments of Sanctuary® and the S.E.L.F. Model. In each of the partial programs the child and family receive high quality treatment services delivered by board certified child/adolescent psychiatrist, masters level therapist, certified teachers, and various mental health professionals. Unlike an inpatient hospital, the partial hospital provides all treatment and education throughout the day allowing the child to return to their families each afternoon. We believe that active participation is the key to treatment success. Families participate through regularly scheduled meetings as well as monthly Parent Nights.